Welcome to Rivendell Irish Wolfhounds…. Rivendell Irish Wolfhounds is a small home kennel west of Madison, Wisconsin. 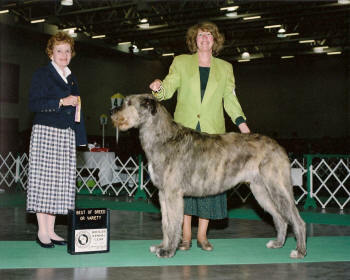 My first experience with Irish Wolfhounds was at Westminster back in 1976, when I fell in love with them and decided I wanted to have one in my life sometime. In 1989, I acquired a companion Irish Wolfhound from Ygdrasil. Galadriel was with me for nine years and was a wonderful buddy. In 2004 I acquired Ch. Erinwood Rivendell Gandolf from Pam Paloma and Ch. 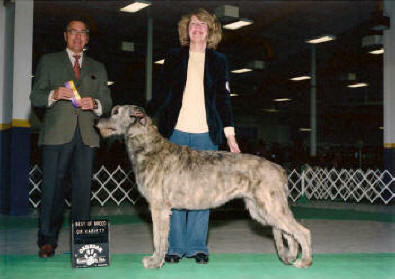 Erinwood Rajean in 2009, also from Erinwood Irish Wolfhounds. Their breeding produced 10 puppies, including Ch. Rivendell’s Riverdance and GCH. Rivendell Aransgris Gabrielle. Jean (Ch. Rivendell’s Riverdance) was bred to Ch. Brimstone Judgment day in 2013 and produced 11 puppies, including Ch. Rivendell’s Mele Kalikimaka (Leilani) and Ch. Rivendell’s Feliz Navidad (Jose). Please see their photos for more information about each of them. Currently, I have Irish wolfhound puppies due on 7/4/18 by GCH Shellane Pavarotti Sings for Slaine x GCH Rivendell’s Mele Kalikimaka (Leilani).